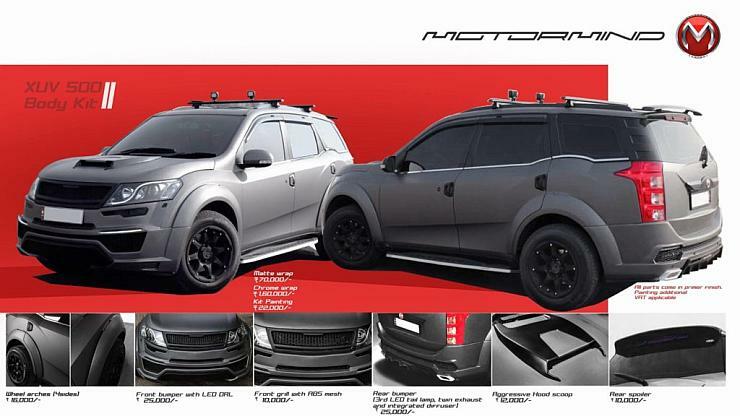 MadMen radical bodykit for Mahindra XUV500! 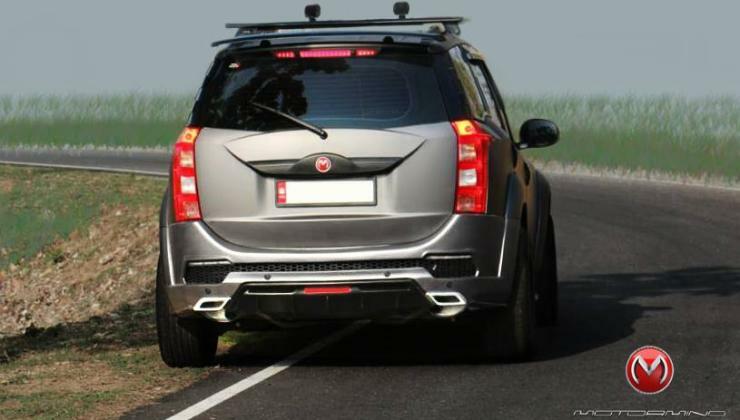 The Mahindra XUV500 is very popular among modifiers in India. Now, MotorMind – a prominent car modder from Bangalore – has come up with a new ‘MadMen’ kit for the XUV500. Priced at 1.58 lakh rupees, this kit aims to totally transform the looks of the SUV, making it really stand out from the hordes of XUVs running on Indian roads. What’s the MadMen kit all about? In short, it’s an interesting customization package that can be modified to suit multiple budgets. From a body kit to a black-chrome wrap, the kit offers multiple customization options that start from Rs. 10,000. The entire kit costs Rs. 1.58 lakhs and that includes a brand new front grille with a honeycomb mesh, a customized front bumper that houses LED DRLs, a hood scoop, muscular wheel arches, roof lights, matte black alloy wheels, custom rear bumper with a faux diffuser, a rear spoiler and a custom wrap in matte or chrome shades. Buyers can opt for single or multiple custom parts based on their budgets. Under the hood, things remain unchanged. The XUV500 is available with a 2.2 liter turbo diesel engine that makes 140 Bhp-330 Nm. For the NCR market, Mahindra offers a downsized 2 liter mHawk version of this engine, with 140 Bhp-320 Nm outputs. Both engines get 6 speed manual and automatic gearbox options. However, only the 2.2 liter motor offers an all-wheel drive option. The 2 liter motor has to make do with a front wheel drive layout. Prices start from 12.49 lakh rupees. Popular engine modifications for the XUV500 include diesel tuning boxes and remaps, both of which boost power and torque significantly. Introduced in 2011, the XUV500 is a seven seat crossover that has single-handedly demolished D-segment sedans in India due to a mix of sharp pricing, feature rich interiors and Indians’ love for SUVs. Nearly 6 years old now, sales of the XUV have begun to show signs of sagging, with monthly numbers falling to under 2,000 units.